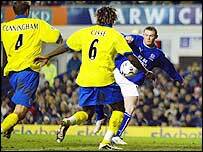 Wayne Rooney came on to inspire Everton to victory over Birmingham in his 50th league appearance for the club. Rooney started the match on the bench but his arrival breathed new life into a combative but dull affair at Goodison Park. The teenage prodigy struck after 69 minutes when Birmingham failed to clear a corner and Rooney lashed home a shot. The closest either team came to a goal before that was when Duncan Ferguson had a header ruled out for offside. Ferguson scored as a substitute in the 3-2 defeat at Manchester United on Boxing Day and was starting for Everton for the first time since October. He was celebrating after three minutes when he headed in Gary Naysmith's cross but his joy was cut short as he was adjudged offside. In a feisty opening to the game each side came close and exchanged chances. Bryan Hughes forced Everton keeper Nigel Martyn into a smart save before the visitors' striker Stern John climbed above defenders David Unsworth and Naysmith but headed just over. Tomasz Radzinski almost got Everton off the mark after some good work from Alex Nyarko only for keeper Maik Taylor to save his effort stretching to his right. The half progressed into a combative affair with chances and eye-catching football at a premium. Rooney was on the bench for Everton and, with the game needing an injection of inspiration, his arrival proved to be decisive. The 18-year-old came on for Lee Carsley and was in the right place to ram home a shot when Naysmith's 69th minute corner came his way. Birmingham may feel aggrieved the referee did not blow for a foul because the pressure Ferguson and Alan Stubbs put on keeper Taylor but the goal stood. Everton: Martyn, Hibbert, Stubbs, Unsworth, Naysmith, Carsley (Rooney 45), Nyarko (Yobo 85), Gravesen, Kilbane, Radzinski (Jeffers 78), Ferguson. Subs Not Used: Simonsen, McFadden. Birmingham: Taylor, Kenna (Kirovski 78), Cunningham, Upson, Lazaridis, Johnson, Savage, Clemence, Hughes (Cisse 67), Forssell, John (Morrison 54). Subs Not Used: Bennett, Purse.